Foxgloves, or Digitalis purpurea, are famous both for their polka-dotted, fairy tale charm and the use of digitalis in heart medications. It’s a highly toxic plant if ingested yet enchanting in a cottage-style garden. For more ideas, see Flowering Perennials for a Cottage-Style Garden. 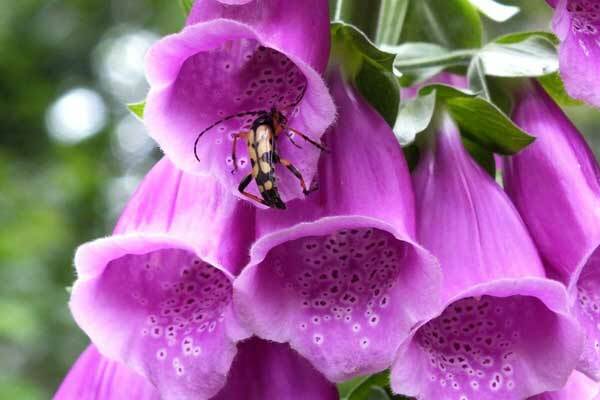 Many favourite garden plants are toxic when ingested, and Foxglove (Digitalis) is a good example of this. 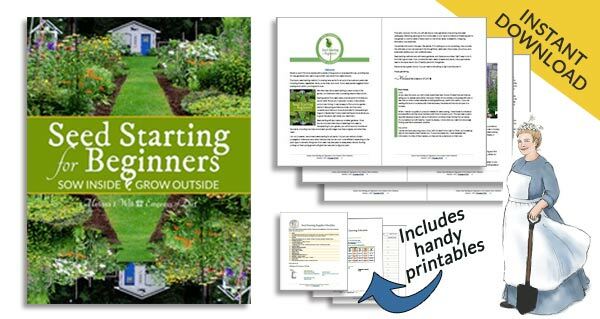 It’s a beautiful plant and many gardeners include it in their cottage-style gardens, but, if you have children or pets who actually try to eat garden plants, you probably shouldn’t have this one, or, a garden at all. Foxgloves are biennials. This means, in a cold climate, they have two-year growth cycle. In year one, the plant forms the stem and leaves. In year two, the flowers appear. Following that, seeds are produced. The plant may become unproductive after that, but, if left alone, the fallen seeds may produce new plants nearby. This certainly works for me: the less I disturb the foxgloves and the surrounding soil, the more plants I get. 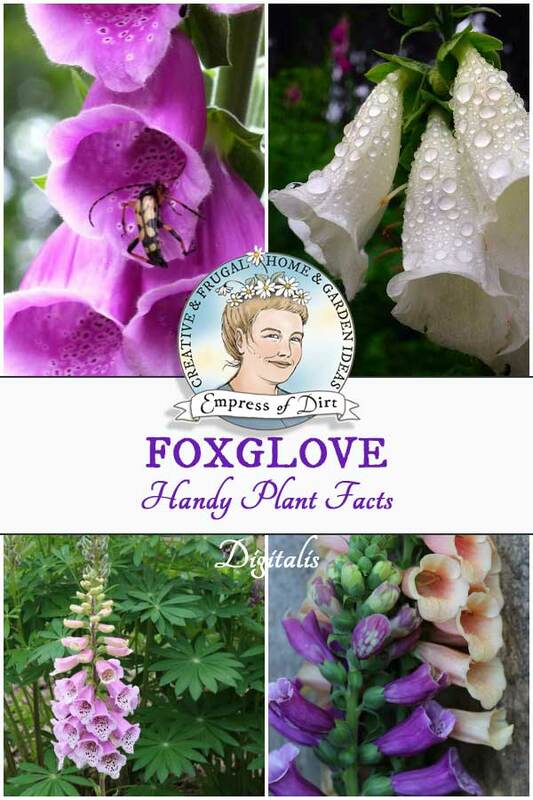 The name foxglove has its origin in Old English, though the exact meaning of the original words is not certain. We think it comes from either fairy gloves or fairy music. Either way, it’s clear that people were as enchanted with them years ago as we are today. The proper plant name, Digitalis, comes from the Latin word digitus, meaning finger or digit, which is much less romantic but equally true. The long tubes of the flowers are indeed like fingers or bell-bottom pants, if you’re old enough to remember what those are. The most common foxglove in our gardens is Digitalas purpurea and this grows to about 2-3 feet in height. Occasionally, on garden tours, I see incredibly tall varieties reaching 6-8 feet. I am not sure if they are purpureas or some other cultivar, but wow, they are fabulous. The stems tend to be quick thick so, even at that height, the flower heads stand up nice and straight. And, combined with the pinks, purples, creams, and yellows, the polka-dots are wonderful. I love watching as various pollinators come by. Many different bees are attracted to the nectar, and climb right into the flower tubes to get their fill. Forms foliage in year one, blooms in year two, may be unproductive after that, though may self-seed for new plants. Dependants Foxglove mug (moth) larvae consume the flowers; lesser yellow underwing (moth) consumes the leaves. 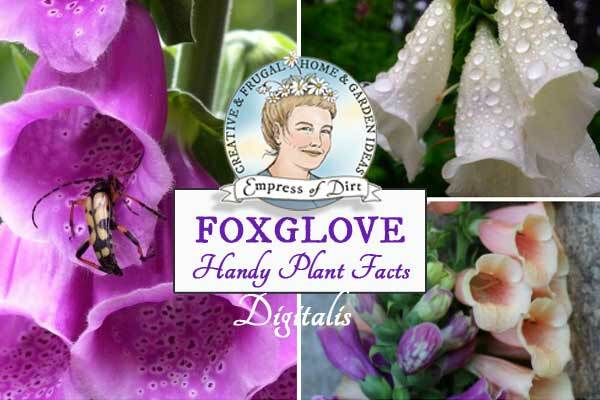 Trivia | Uses The name ‘fox’s gloves’ has its origin in Old English though the etymology is uncertain. The name may have derived from original names meaning fairy gloves or fairy music. The genus name Digitalis is from the Latin digitus (finger). 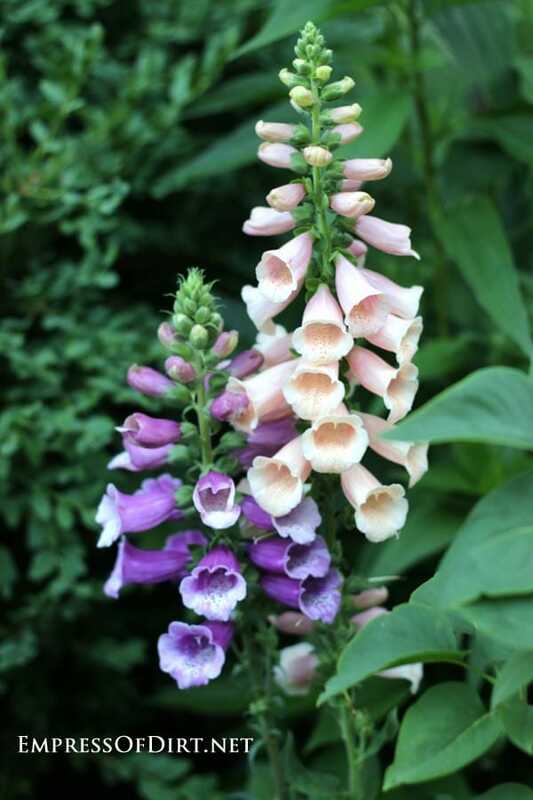 Medicinal drugs including digoxin, which contains cardiac glycosides, are prepared from various Digitalis (foxglove) plants. This medicine is used to increase the contraction of the heart. 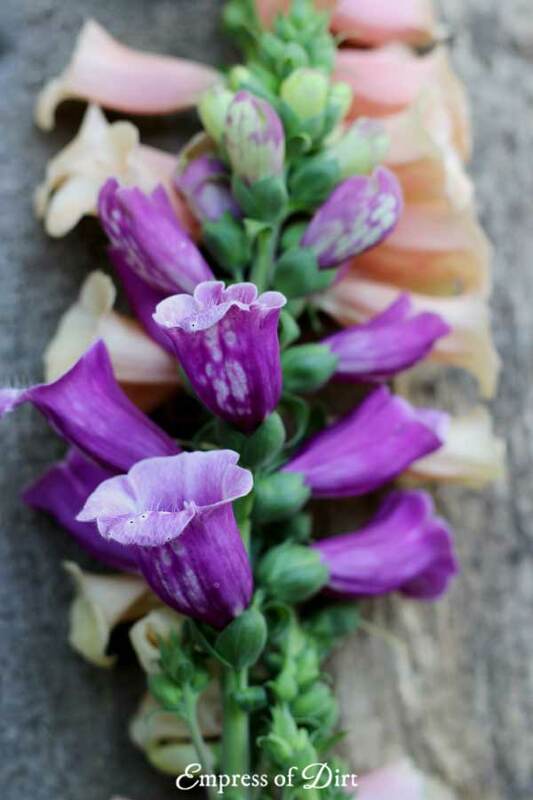 The entire Digitalis plant is toxic, including roots and seeds. Yes, in some areas. 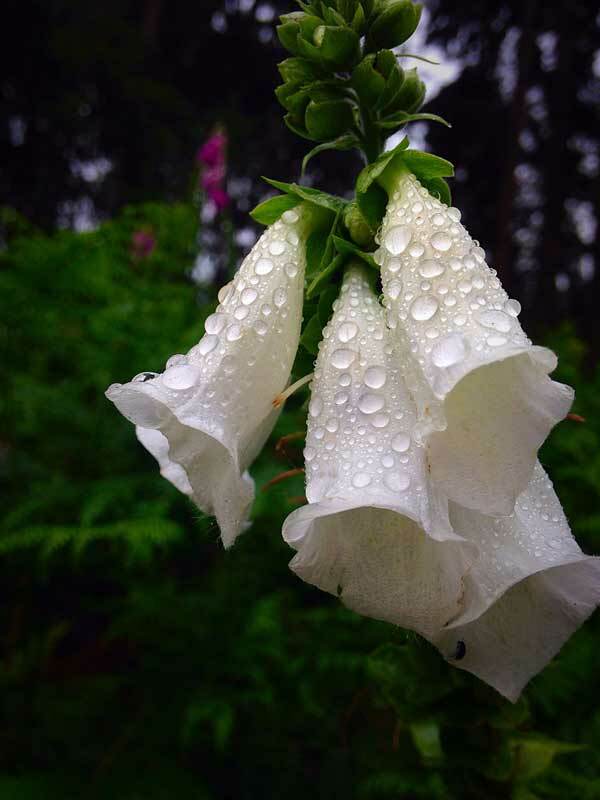 The most common foxglove, Digitalis purpurea is considered invasive in parts of California. Always check with your local extension office or governing body that oversees invasive species for specific information. 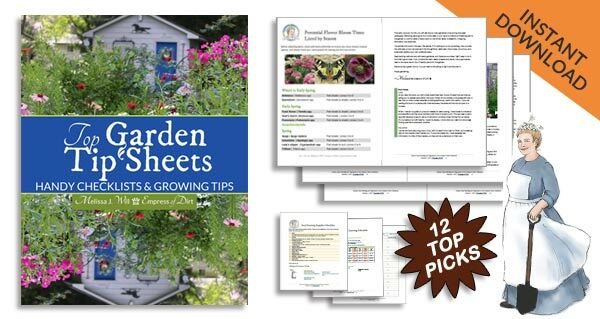 I’ve listed my go-to plant databases and resources here. 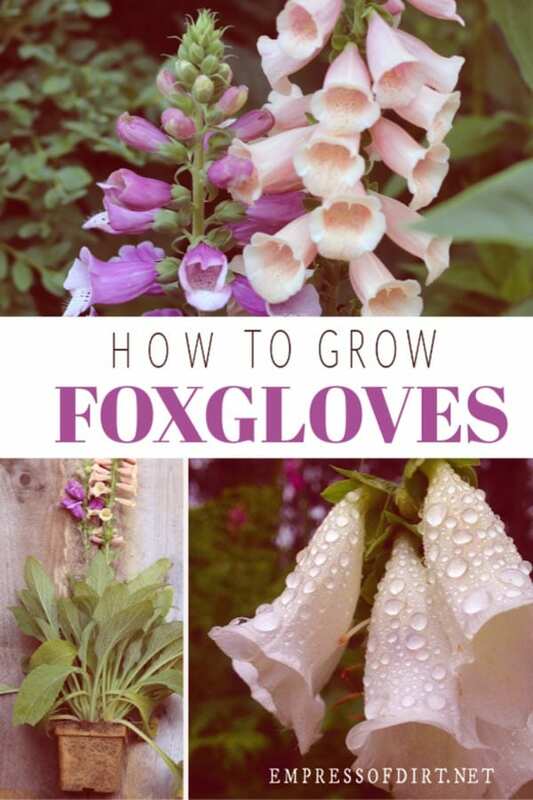 2 Can I grow foxgloves in containers? Just about any flowering plant including foxgloves can grow in containers with proper conditions and care. You will need to provide good quality potting mix, adequate water and shade, and frost-free shelter for the winter months, to prevent the container from freezing or breaking. ‘Overwintering’ requires the gradual introduction to storage conditions (out of freezing weather) and reintroduction in spring. Here’s an example with my fig trees. 3 Do foxgloves attract pollinators? Yes, hummingbirds and bees are both attracted to the flowers. The flower shape is best-suited for the long proboscis of the hummingbird. Bees can be seen crawling inside. The longer-tongued bees are adept at getting the nectar. 4 Can I grow foxgloves from seed indoors? Yes, it’s possible. They like temperatures in the 60-65F range (15-18C). For my garden, I have the best luck with self-seeding outdoors. I leave the foxgloves alone, let them bloom and go to seed, and reseed naturally. This generates far more new plants than I can grow successfully from seed indoors. Happy gardening! And be sure to sign up for the free newsletter. I have a field of foxgloves here in my garden in the NC Blue Ridge mountains by just letting them go to seed. I get lots of seedlings in my pea gravel walks that I move to the beds. To keep the garden a little less scraggly I pull up or cut back many of the plants after flowering but leave many, usually the nicest ones that I want to self-sow. I love that my most prolific “weeds” are foxgloves, forget-me-nots, columbine and hellebores. It’s English cottage garden heaven in my eyes. I planted 3 Foxglove plants this past spring and they were incredibly beautiful. Glad to know about the self-seeding success you experienced. I was going to try and save seeds, but now I’ll just let them go. Thank you for your wonderful and informative newsletters. I was just wondering if deer and other wildlife ear Foxglove; I want to make sure they don’t die from it. Hi Christine, Wildlife survive because they have instincts guiding them to food sources that sustain them and avoid things that are distasteful (and often toxic). Nature is smart! Foxglove is a favorite and I try and try to get a good patch growing and will continue until I succeed.